Connecting the dots in the Leeward Islands from Dominica to Guadeloupe to Nevis provides a delightful cruise through a few beautiful, yet distinct Caribbean islands. Starting with the southernmost point of Dominica often enables sailors to sail comfortably downwind with the trades to Guadeloupe and Nevis. Exuding raw natural and human energy, Dominica appeals to adventurers needing to bust out and get muddy. While devastating storms in 2015 and 2017 have knocked down huge swaths of forest canopy and torn up countless homes and businesses, they have not destroyed the resilience or hospitality of Dominicans. 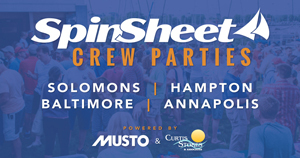 For several years, cruisers have been welcomed into Portsmouth harbor by members of Portsmouth Association of Yacht Services (PAYS). These enterprising men offer cruisers a variety of services from providing security in the harbor, guiding tours of the island, and hosting weekly barbecues. Post-hurricane, they have also taken on cleaning up and reestablishing the mooring field in the harbor. 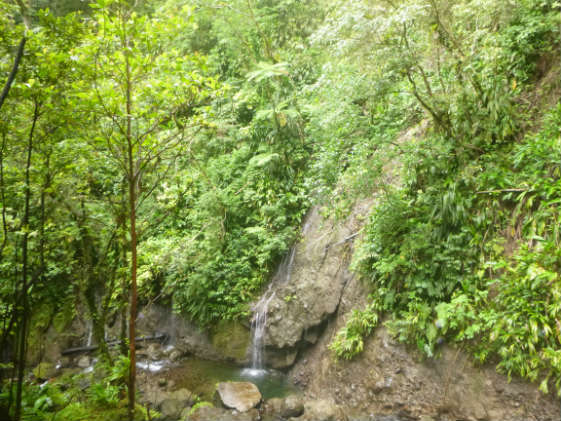 Several hikes into the largely undeveloped interior of Dominica let visitors escape from the shore into the jungle. Guides offer car trips to several trails in the northern rainforest with lots of slipping in the mud, clambering over boulders, fording rivers, and soaking in the spray of waterfalls. A popular tour winds up the Indian River. Herons, hummingbirds, and bananaquits twitter and chirp among the Maria-pruned trees. Just outside of Portsmouth, hikes to a lush swimming hole and a hot spring are within walking distance. Bertram Jno. Baptiste, the local bird expert, shows off Dominica’s feathered inhabitants. He’ll likely lead cruisers up narrow mountain roads, point out colorful hummingbirds and the two indigenous Dominican parrots, pick bags of wild watercress, and tell riveting stories of life in Dominica. Though just a short sail north, Marie-Galante and Îles des Saintes, sleepy French Caribbean islands on the south side of Guadeloupe, offer a stark contrast to Dominica’s wildness. Here, boulangeries take the place of rain forest streams; cafés offer breaks from the midday sun, and restaurants aplenty serve fine French and creole cuisine. Marie-Galante is home to three rum distilleries that produce rhum agricole, a rum made from freshly squeezed sugar cane juice instead of molasses. The distilleries are open to the public, and all the distilleries offer free tastings of their products. 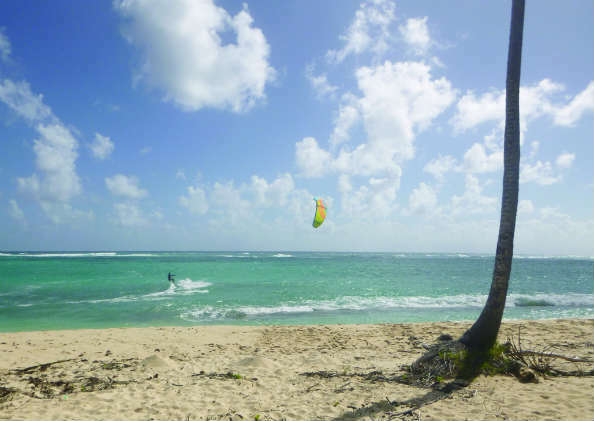 A morning of rum tasting should naturally be followed by an afternoon of lazing on the beach, and the beach at Capesterre fits the bill with long stretches of frothy coral sand and inviting beach bars. In Les Saintes, convenient boat access to Terre de Haut, Pain de Sucre, and Îlet à Cabrit offer different experiences of this small island chain. Terre de Haut has a quaint infrastructure including restaurants, bakeries, grocery stores, and shops with hand-made crafts. 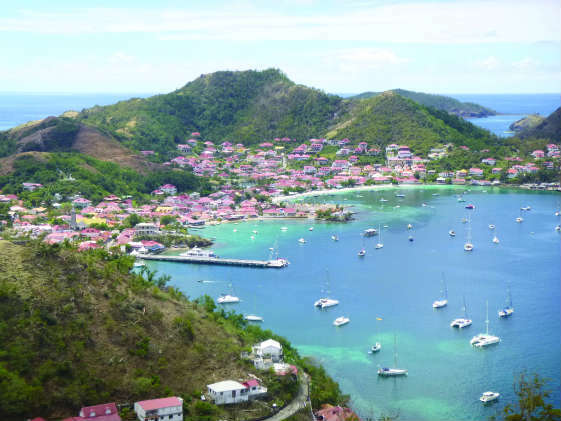 Hikes to Fort Napoleon and Le Chameau offer impressive birds-eye views of Les Saintes. Across the channel from Terre de Haut lies Îlet à Cabrit. Currently home to chickens, goats, and stray kittens, Îlet à Cabrit housed many soldiers at Fort Josephine until the 1920s. At one point, in an imaginative leap, the fort was revamped as a nightclub. Today, hiking trails lead around and through the fort to breathtaking views of the neighboring islands. The underwater views off Îlet à Cabrit beat the hilltop views—no easy feat. Masses of healthy coral, thousands of fish, scores of barrel sponges, and a few moray eels live just off the island’s points. Pain de Sucre, named for its basalt-column cliffs, hosts an array of sea life that make for memorable snorkeling and diving as well. A popular port on Guadeloupe’s northwest coast, Deshaies serves as a natural entry or exit point to Guadeloupe. Its charming restaurants and close proximity to stunning scenery encourage sailors to stay a day or two. Flower lovers will enjoy the botanical gardens a short walk outside of town. 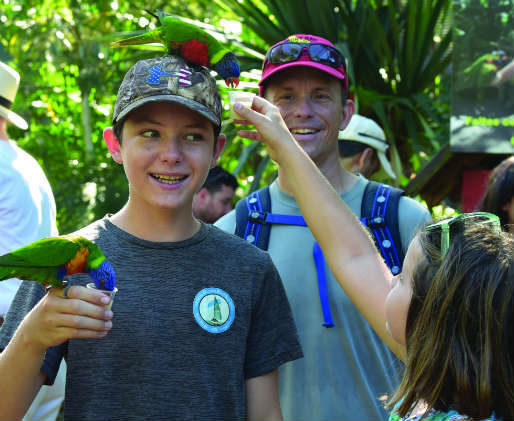 Acres of well-cultivated tropical blooms and colorful birds tickle the senses. Australian lorakeets with purple, red, and green plumage eat nectar from visitors’ hands and perch on their heads. Those needing a walk on the wild side can scramble up the Deshaies River. Boulders large and small form an unmarked trail leading the way up the river to a waterfall. The sail from Guadeloupe to Nevis passes the islands of Montserrat, with its surreal landscape of volcanic ash, and Redonda. Both make difficult stops. Redonda has a reputation as an anchor eater and offers no easy landing. Montserrat welcomes visitors with friendly, genuine openness, but lacks a protected harbor, making the main anchorage in Little Bay tenable only in relatively settled weather. 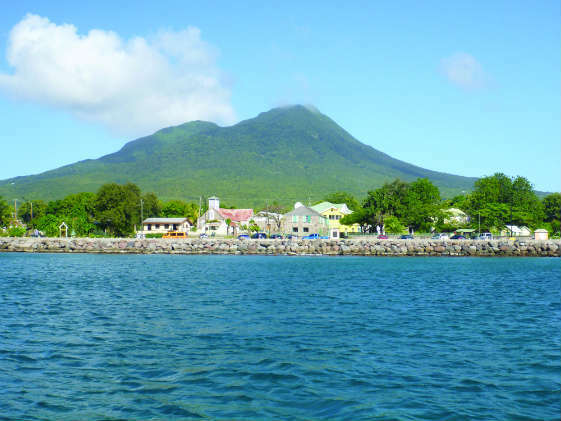 Settling somewhere between the wildness of Dominica and the French influence on Guadeloupe, Nevis holds many attractions. Under beautiful cloud-covered Nevis Peak lie several mooring fields abutting long stretches of sandy beach. For some, watersports on daysailers complement evenings at anchor. Nearby is quaint Charlestown, capital city of the island and birthplace of Alexander Hamilton. Charlestown has museums, an open-air market, and plentiful shopping. Away from town, amazing hikes into the cloud forest and restaurants and inns built from the ruins of old sugar plantations only add to the charm. Of course, if you’re up for it, you could reverse the dots back down or just keep connecting the dots to islands such as St. Kitts, Statia, and Saba—there’s so much to explore in the Leeward Islands. “The Cruising Guide to the Northern Leeward Islands” and “The Cruising Guide to the Southern Leeward Islands” by Chris Doyle. Contact information for Bertrand Baptiste is included in Chris Doyle’s chapter on Dominica. “Ready to Get Wet? Top 10 Hikes of the Caribbean Islands” by Michael Sweeney. Details on hikes in Dominica and Deshaies are found inside.